Save-the-date for the "Hormone & Heart Health Seminar" on Sunday, May 15th, from 10am-2pm that will feature Dr. K.B. Lim, board certified in OB-Gyn, to speak more about soy and hormone health. Soy is also great for heart health, which Dr. Al Hassan, board certified in internal medicine, will be discussing as well. We'll also be partaking in a delicious lunch that will feature soy products. Sign up to take your spouse or a friend along to receive a discount! Many of us have heard, "Don't eat too much soy, that's bad for you!" Stories of men developing breasts or promotion of breast cancer from soy consumption have circulated. Soy is made from soybeans (also known as edamame) and can create products such as soy milk, tofu, tempeh, miso and even soy meats and cheeses. Dr. Xiao Ou Shu, associate director of global health and co-leader of the cancer epidemiology research program at Vanderbilt University. developed the Shanghai Breast Cancer Survival Study composed of more than 5,000 breast cancer survivors. Estrogen does play a key role in breast cancer development and progression. The good news is the study found that soy foods not only have an antiestrogen effect but also have anti proliferation, antioxidation and many other anticancer effects. Both laboratory and epidemiological studies have shown that soy food can reduce breast cancer recurrence and increase survival rates. Researchers at the University of Southern California found in 2008 that women consuming 1 cup of soy milk or 1/2 cup of tofu daily had about 30% reduced risk of breast cancer compared to those who ate very little soy. Similarly, the Shanghai Study showed women who had previously been diagnosed with breast cancer that regularly consumed soy had a 32% decrease in reoccurrence of cancer. Men, the good news is The American Journal of Clinical Nutrition published a study showing a 26% decrease in prostate cancer with increased soy intake. Soy does not appear to affect testosterone levels. **Serve with whole wheat toast (such as Ezekiel brand) or in a whole grain or corn tortilla. If you like it spicy, add some Sriracha or red pepper flakes! Press the block of tofu between two plates to remove excess liquid. Do this with a couple of paper towels between the tofu and the bottom plate and a can of vegetables or other weight on top of the top plate. Replace paper towels with new ones as they become saturated. Press tofu for at least 30 minutes—the longer, the better with 2 hours being ideal. This step is optional but does create a firmer texture. Combine turmeric, black pepper, salt, and parsley in a small dish. Sauté onion and garlic in broth until tender. Add bell peppers, zucchini and mushrooms and cook until softened. Crumble tofu into skillet, sprinkle mixture with combined seasonings and cook, stirring over medium heat until heated through. 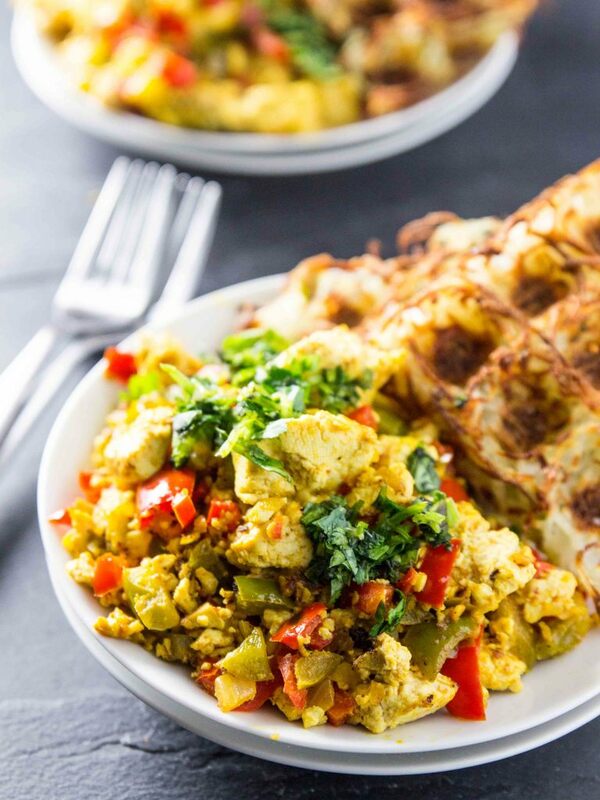 Stored in a covered container in the refrigerator, leftover Breakfast Scramble will keep for up to 2 days. Recipe adapted from The Survivor’s Handbook: Eating Right for Cancer Survival by Neal D. Barnard, M.D. and Jennifer Reilly, R.D.